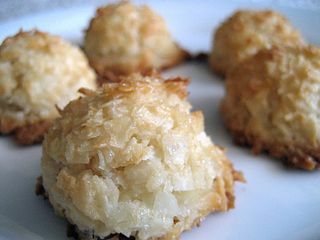 Coconut macaroons are one of my favorite desserts. I can't really tell if they are cookies or candies. It doesn't matter. They are delicious. If you like coconut, chances are, you will like coconut macaroons. In fact, the inside of a Mounds or Almond Joy candy bar is basically a coconut macaroon. Coconut macaroons are delicious just as the recipe makes them, but there are so many ways you can umph-up the flavor. If you really like the candy bars mentioned above, melt some dark chocolate chips (for Mounds lovers) and dip the baked and cooled macaroons in it, or if you like Almond Joy, press an almond into the top of each macaroon before it cools, allow them to cool, and then dip in melted milk chocolate chips. Set them in the freezer for a while to let the chocolate harden, then share or enjoy all for yourself (watch out, calorie alert here!). In a medium mixing bowl, stir together egg white, sugar, vanilla, almond extract, and a pinch of salt, then stir in coconut. Drop by rounded tablespoons onto baking sheet (at least two inches apart). Bake until tops are light gold in spots, 15 to 20 minutes. Cool for a few minutes, then use a spatula to lift the macaroons from the pan onto a cooling rack. Cool completely, store tightly covered.